Though each person's story is different in detail, common themes of coping, grieving, and reconciling loss are reminders of the long journey surviving family members have taken and how important it is to embrace them with our most loving and compassionate responses. 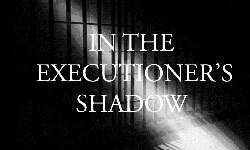 While each has endured the extreme pain of losing a loved one to murder, they are all staunchly opposed to more violence in the form of a state-sanctioned execution and a death penalty. Aba Gayle of Silverton says in part, "Now I know that having someone murdered by the government will not heal my pain." 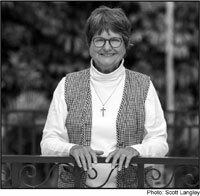 Not in My Name is introduced by Sister Helen Prejean, nationally known author and speaker, who has visited Oregon on several occasions and will return in May 2018. Sister Helen's profound words are always inspiring. 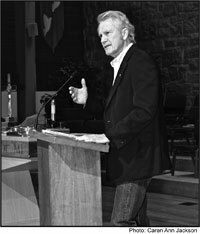 The forward of the book is provided by former Governor John Kitzhaber, writing about his own experience administering the death penalty. "I still think about my decisions in 1996 and 1997. I believe those decisions were wrong. I find comfort in the stories of other Oregonians in this book who have struggled to find a deeper moral truth." Gus Lamm, a retired mental health counselor from Eugene states, "The scales of justice are out of balance when it comes to the death penalty." His story joins the stories of three other residents of Eugene and Springfield. Losing a daughter, a sister, a mother, all of the storytellers deal with their profound sorrow while honoring their loved one by working to move away from more violence with messages of peace and reconciliation. OADP understands that not all family members express similar feelings toward those who have killed their loved ones. Regardless of their stance on the death penalty, we need to support family members of murder victims. Generally, they do not ask for or expect sympathy. Rather they appreciate our acknowledgment that their loss can be felt by all of us and our efforts to provide resources that support them through the most difficult times of their lives. Not in Our Name will be handed out as long as supplies last at all OADP events. You can obtain your own copy through the oadp.org website. 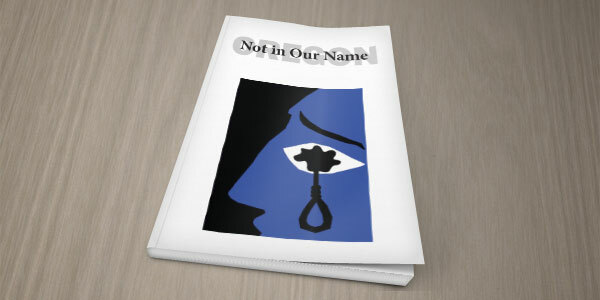 We are eager to create ways for Oregonians to use this compilation of powerful, intimate, and touching stories to learn about the death penalty and its detrimental effects on our culture. Create reading groups, discussion groups, invite family members to speak at your church or at your book club, or host an event to discuss restorative justice and reconciliation using Not in Our Name as common text. OADP has resources and speakers to help citizens throughout the state create dialogue. For more information and to secure your own copy, call 503-990-7060. 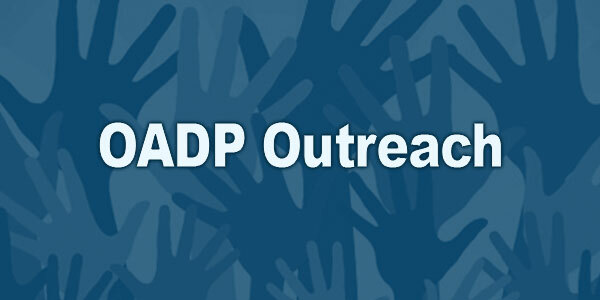 The OADP board of directors is an all-volunteer group providing leadership, hard work, and financial support. As 2017 ends, the board will have provided an estimated 3,500 hours of volunteer service to the mission of repealing the Oregon death penalty. 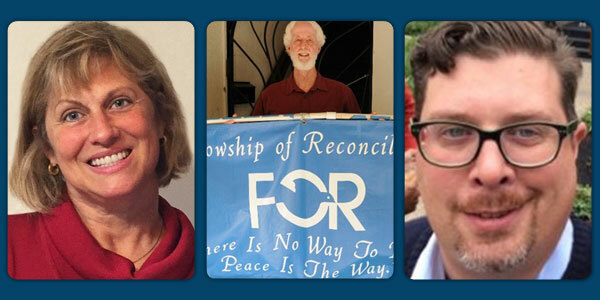 During this year the board of directors has added three new members. With the newest addition of Lynn Strand, the board now numbers 13. This is the largest number of board members in OADP's history. Lynn Strand is a retired dentist. 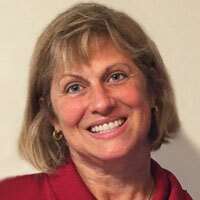 She practiced in Lake Oswego, specializing in endodontics. A native Oregonian, she grew up in Independence and is a graduate of Willamette University and the OHSU School of Dentistry. She has served on the OADP Advisory Council for the past five years with passion. She is a frequent OADP volunteer, one of the leaders of the OADP Correspondence Committee, and a frequent visitor of her death-row penpal. 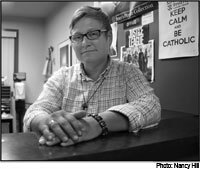 In addition to her active abolitionist role, Lynn has a very active church life at Our Lady of the Lake parish in Lake Oswego, where she is president of the parish's St. Vincent de Paul Society and social outreach efforts. As an active Advisory Council member, Lynn has been engaged as a liaison between OADP and Catholic parishes in the Portland Archdiocese. She lives in Oregon City with her husband Brian. Their daughter Elizabeth is a freshman at Willamette University. Lynn is committed to the repeal of the Oregon death penalty and a welcome addition to our board of directors. 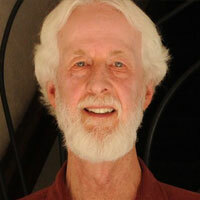 Another of our new board members is Salem's Bruce Stock. 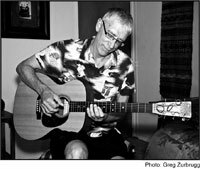 "Working for peace and justice through non-violence" is Bruce's mantra as leader of the Salem area Fellowship of Reconciliation. Bruce is a conscientious objector to war. Framing his commitment to working with OADP, he states, "I see that the death penalty is also a peace with justice issue, and that war and the death penalty are intertwined with the same issues." Bruce has been serving on the OADP Advisory Council, serves as coordinator for the Salem Fellowship of Reconciliation, Salem Area Leader of the Salem area Alternatives to Violence Project, and chair of the YMCA Service Club. Bruce is a sterling example, like our other board members, of the saying "If you want to get something done, find a busy person to do it." Much of his board service will be focused on outreach to other peace-seeking organizations around the state. The third 2017 addition to the council is Portland's Lance Mayhew. "Killing human beings is immoral," states Lance as he explains why he wants to serve. Like the other two new board members, Lance has move up from the OADP Advisory Council. 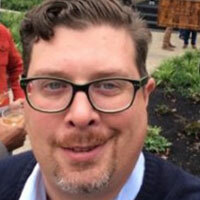 Well known in the Portland area for things other than criminal justice work, he is a food, drink, and travel writer in both print media and radio. His background also includes experience in prison ministry as a volunteer with Crossroads Bible Institute, creating positive relationships inside and outside prisons. Add to this his experience with marketing, public relations, and government relations, Lance will add a great deal to our OADP efforts to engage with Oregonians from all walks of life. Lance is now serving on the OADP Correspondence Committee. He has become a regular visitor and correspondent with an Oregon death row inmate and also writes to death row inmates in other states. Americans' support for the death penalty has dipped to a 45-year low according to results of the 2017 Gallup poll. In its poll of 1,028 adults polled between October 5-11, 55 percent of Americans said they are in favor of the death penalty. This new result dropped from 60 percent reported in October 2016. This drop of five percentage points, represents an eight percent decrease in the level of support for the death penalty nationwide. The Pew Research Center, which also measures death penalty support, reported the lowest figure in 45 years when its 2017 poll showed 49 percent of Americans saying they supported the death penalty for persons convicted of murder. These polling figures, along with Oregon polls, are very important to the OADP campaign to repeal the death penalty since a vote of the people is required to change the law is written in the Oregon Constitution. When analyzing the national polling numbers from both Gallup and Pew it is important to note the wording of their polling questions. 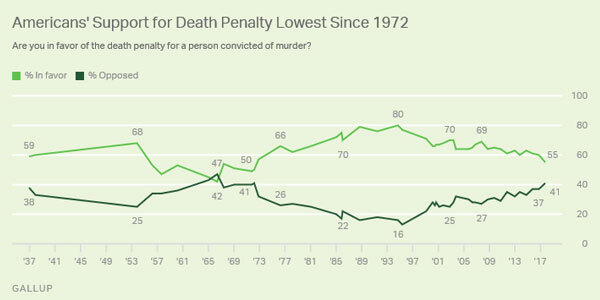 The Gallup question asked, "Are you in favor of the death penalty for a person convicted of murder?" When the polling question is altered slightly, the results change to a number representing less support. When asked as "If life without parole is the available alternative, are you in favor of the death penalty for a person convicted of murder?" In the 2017 Gallup poll, the results reflect party-based divergence in views — 72 percent of Republicans say they favor the death penalty as compared to 58 percent of Independents and 39 percent of Democrats. Death-penalty support among Republicans fell by 10 percentage points, from 82 percent just before the general election of 2016. According to Gallup, death penalty support plummeted 26 percentage points among Democrats since 2002 —a 40 percent decline. Support for the death penalty has also declined among respondents identifying themselves as Independents, falling 10 percentage points since 2000. Much of the decline in polling numbers and opinions of Republicans and voters who identify themselves as conservatives is due to the increase in outreach and conversations stimulated by organizations such as OADP and Conservatives Concerned About the Death Penalty (CCADP). This research and outreach organization is a project of Equal Justice USA. Information from CCADP can be found at conservativesconcerned.org. The death penalty is wasteful and inefficient: The death penalty's complexity, length, and finality drive costs up, making it much more expensive than the alternative of life without parole. Innocent lives are at risk and in the balance: Since 1973,160 people have been freed from death row after evidence of innocence revealed that they had been wrongfully convicted. The death penalty fails to deter crime and murder: The death penalty does not deter acts of violence, and it siphons resources from effective tools that do. Many law enforcement officials say the death penalty only distracts from the goal of public safety. The death penalty fails victims' families: The death penalty is neither swift or sure. The death penalty prolongs pain for victims' families, dragging them through an agonizing and lengthy process that promises an execution at the beginning but later results in a different outcome. This is known broadly by family members as "the closure myth." Important Republican positions such as wasteful government spending, fairness, protection of the innocents, law enforcement, and education are pushing opposition to the death penalty. OADP is reaching out to all voters to learn about, think about, and talk about the death penalty. When conversations lead to dialogue that openly shares points-of-view and people discuss the death penalty with full information, the polling numbers in Oregon will move to a point showing a clear path to repeal. Please join in that outreach effort. To repeal the Oregon death penalty, it is necessary to get Oregon voters to understand the variety of complex issues that a death penalty raises. Cost... fairness... innocence... racial bias... victim family members... moral truth... the exonerated... the role of the state... the alternatives are some of those issues. Since Oregon has a moratorium on executions established by former Governor John Kitzhaber and maintained by Governor Kate Brown, some voters may feel there is no need or pressure to work toward an all-out repeal. Because Oregon has had only two executions in the past 53 years (both male volunteers), many are not even sure Oregon has a death penalty. WE DO, and it is a costly, arbitrary, and a failed public policy. While there are no executions presently, the death penalty process goes on with appeals, new trials, and sentencing, which all include the possibility of additional death sentences. That process costs Oregon taxpayers an estimated $29 million annually. OADP is pursuing a strategy to increase our outreach and promote a robust conversation about the death penalty so voters can have a better understanding of the death penalty and the ripples that emanate from that sanction. During 2017 and heading into 2018 it is an important part of our strategy to plan, stage, and host as many opportunities as possible to promote those conversations. The list below includes just some of the OADP-initiated events that have taken place. These are times for people to learn, think, and talk about the death penalty should suggest additional occasions for 2018. Presentation to Knights of Columbus. Visits with scores of Oregon legislator. Engage with representatives of ACLU-Oregon, Oregon Justice Resource Center, Ecumenical Ministry Oregon, Oregon Criminal Defense Lawyers Association, Oregon chapters of Amnesty International USA. Engage with staff and members of NAACP. Engage with Racial Justice Organizing Committee. Presentation to Salem Racial Justice Commission. Sponsorship at monthly Salem Progress film series. Participation by various OADP board members in large and small discussion groups. Table at conferences, fairs, and events of The Dorchester Conference, National Association of Social Workers, Corvallis Solidarity Fair, Salem Peace Lecture, Fellowship of Reconciliation to name a few. Presentations at various colleges, universities, and high schools. Major events with former Governor John Kitzhaber, former DOC Frank Thompson, and several OADP board members as speakers. Dramatic presentations of Clarence Darrow by renowned actor Gary Anderson. Video presentation on cable TV outlets in Portland, Salem, McMinnville, Monmouth, Independence, Milwaukie, Oregon City, and others. Presentations and discussion groups at various congregations, conferences and social action committees of United Methodist, United Church of Christ, ELCA Lutheran, Catholic, Jewish, Episcopal, Presbyterian, Mennonite, Unitarian. Literally hundreds upon hundreds of individual conversations designed to create dialogue for learning by members of the 13-member OADP board, 90+ Advisory Council and countless numbers of supporters. Be an advocate. Be a discussion leader. Be a person willing to provoke the essential conversations that provoke dialogue and learning. OADP has resources of materials and speakers to help you get started. Make it a New Year's resolution to join in this meaningful endeavor to repeal the Oregon death penalty. As we come to the end of 2017, a year that showed progress in our journey toward repeal, we still have a way to go. We need your support. Please consider making a donation. Send checks to P.O. Box 2765, Salem OR 97308 or go to oadp.org/donate and donate by credit card. We thank you for your support in the past and in advance for a year-end donation of support.